Happy New Years to all you once again! Man, I have to say this year went by hella fast! I hope you enjoyed this year as much as I did and look forward to a long, healthy, prosperous live for the next year to come. We’re in need of a few working bodies so if you have time come and join! However, if you have what it takes to help, please talk to either me (Korokun) or Saoen via mIRC, or catch us idling in #m.3.3.w@irc.rizon.net! *Available all times of the day minus nighttime. However timezones, and days maybe varied. **Same as above but make sure you highlight him to catch his attention. Because, uh, yeah… ITSA ME, MARIO! Out NOW!! – Order yourself a copy today! Really Really Pretty Damn Random ™ – (Part III) – Happy 25th Birthday, Mario! 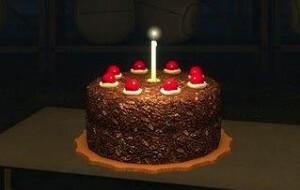 Yeah, random at best but hey if you like the pasta eating, spandex wearing, “Mama Mia!”-ing, rescuing princess left and right with no hard feelings, “Luigi who-ing?”, friend of a nemesis of an ex-boyfriend, “I’m still going to nab your girl” plumber then go right on ahead and celebrate his birthday today!! Yep. We’re still slow, but Mario OVA, Hen Zemi, Getsumen and Mitsu will come out soon… Just the question when is always a toughie at best. Super Mario Bros on Violin! Super Mario All-Stars Wii – confirmed! Edit (09/22/10): Additional Links and Information. **Mind you I’m just doing this because I’m a fag for said plumber, and the current released OVA is horribad. However, in due time we will release it and you’ll see the fruits of our labour. It’s birthday season here at m.3.3.w! Let’s put our hands together, and fish out those cakes for our venerable xess, and spunky SpiegelEiXXL, who are getting greyer and wiser and adding an extra candle to their birthday cakes! They both were very quiet about their birthday’s, so I thought I’d share it with the world and it’s only natural that we should take this opportunity to thank them for all their tireless hard work, enthusiasm and dedication, in bringing out those fabulous subs that we all enjoy. I hope they go and do something fun for their birthdays (and eat lots of cake). In other news, our former partner, Baka-Wolf, celebrates it’s one year anniversary today.